Some day you will be mine Nerf Man! "Even you, Nerfman, with your great speed and sponginess can't intercept both Nerf rockets." 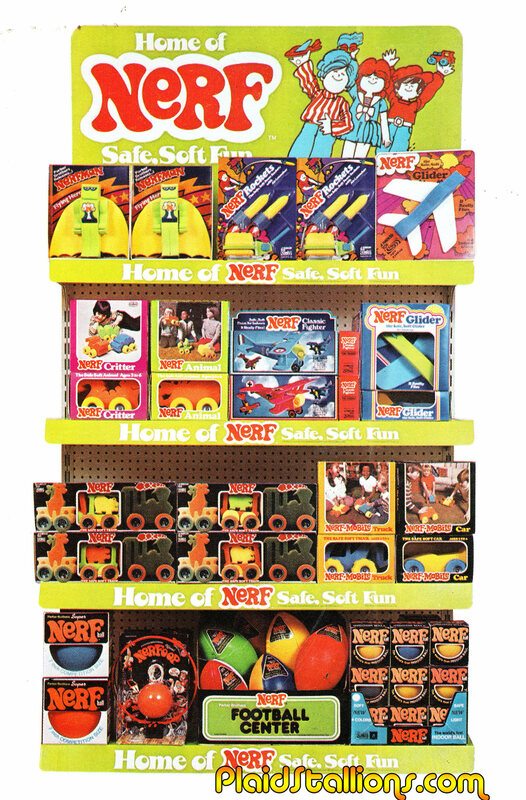 It's nice to see Nerf in the now long-abandoned context of "Safe, Soft Fun". Even the logo looks safe, soft and fun. 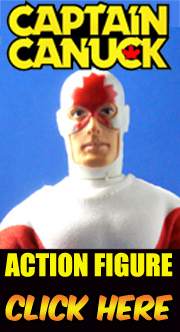 ...as opposed to the company's current focus, which is encouraging children to enlist in The N-Force. There they learn how to field-strip and service a variety of small-arms up to and including a belt-fed fully automatic cannon. Today, Nerf has become the toy-department arms merchants in a literal sense, building the company's profits on selling not only the arsenal but also the ammunition for it. The N-Force also offers several varieties of edged weapons so boys can have the same wartime experiences of child-soldiers throughout the third world: running out of ammo, dragging an enemy down into the mud and stabbing them to death. Nerf offers some fairly spectacular contests from time to time, with incredible amounts of their products as the grand prize. Sadly, the company still hasn't ever offered a family vacation to the nearest veterans' hospital. Seems a strange omission on Nerf's part. After all, most kids would be thrilled by the chance to meet the grown-ups on the N-Force, especially the ones getting fitted for prosthetic limbs and recovering from facial reconstructive surgery. Well, maybe next year. Might be a nice promotional tie-in when the company eventually introduces its own line of N-Force branded IEDs and land-mines.